Momofuku Milk Bar Marshmallow Cornflake Crunch Cookies I.E. Don't Judge A Book By It's Cover! I don't know how many of you have heard of Momofuku Milk Bar but it's one of the most genius places in the world. It's not a kosher place, but it's a bakeryish kind of place in Manhattan (and Toronto). Christina Tosi is the brains behind it all. With the revolutionary idea to put milk powder in her products, she has created a cult-like following that has people from around the world flocking at her doorstep. Her amazing creations range from Cereal Milk Ice Cream to Compost Cookies with miles of delicious innovation in between. I would never have known what I was missing, and worse than that never would have added this recipe into my monthly cookie round up had it not been one of those late night-scroll-through-the-internet-instead-of-sleeping kind of searches. I magically found these cookies and, though I'm not sure what possessed me to try them, I put it on my ever growing to do list. The truth is I'm pretty shallow when it comes to food. I'm one of those people who believes you eat with your eyes first. It's always super important to me to wipe the plate, arrange artfully, and sprinkle something green and necessary on my food (herbs or spices). I know I'm not the only one. The entire basis of Instagram is eating with your eyes. Until they invent Instagram smell you are all guilty of judging books by their covers! So ha! The crazy part is, it's such a big part of human nature to "eat with the eyes" that food photographers actually have a challenge creating the vision our mind expects to see in a photograph. In reality, milk isn't pure white and thick and maple syrup isn't super drippy and golden colored when it's poured. Food photographers actually have to replace milk with Elmer's glue and maple syrup with motor oil to create the image we want to see so that we want to buy or make that product. It's a waste of a perfectly good pancake in my opinion. The next day, I got report back from my family, "What were those amazing cookies and when could we get more?" As shocked as I was, I decided I should at least try the cookie and see what the hype was about. I did. I nearly died. My favorite cookie texture isn't usually crispy but the crunch of this cookie was both delicate and hearty at the same time. The flavor, don't get me started on the flavor. The carmel-malted milk-with-a-hint-of-chocolate flavor is unreal! It's like all I want to do is put these cookies on top of and into everything I've ever made. For a while I would walk around with bags of these cookies in my purse and share them with friends. I loved watching their faces as they bit into this unassuming cookie and their eyes would go wide with surprise. One friend told me she loved that they were so ugly because that way no one even asked for one and she didn't have to share it, until someone tasted it. Despite the long weird name and the ugly first impression, these cookies have earned me loads of late night request texts and a few stalkers. If you aren't ready for that, these cookies aren't for you. But if your ready for a whole new world of delicious indulgence like you have never had before, I suggest you double the cornflake crunch recipe and keep it in your freezer. I don't lie when I say these cookies run out fast!! Note: These cookies use milk powder and therefore can only be made dairy. You are welcome to substitute powdered coffee creamer but I have not yet tried this and cannot vouch for the results. Spread the cornflake clusters onto a parchment/silpat lined baking sheet. Bake 20 minutes tossing midway so they don't burn-until they look toasted, smell buttery, and crunch when cooled slightly. Add egg and vanilla extract and beat 7-8 minutes. On low speed, mix in flour, baking powder, baking soda, and salt until just combined (1 minute max.). Don't step away from the machine/over-mix! Scrape down sides and, still on low speed, paddle in the cornflake crunch and chocolate chips until just incorporated (30-45 seconds), then stir in the marshmallows as well. Bake about 15 minutes, until browned around the edges and beginning to brown in the center. Cookies will puff, crackle, and spread. If they seem pale and doughy on the surface, leave in the oven for about 1 more minute. 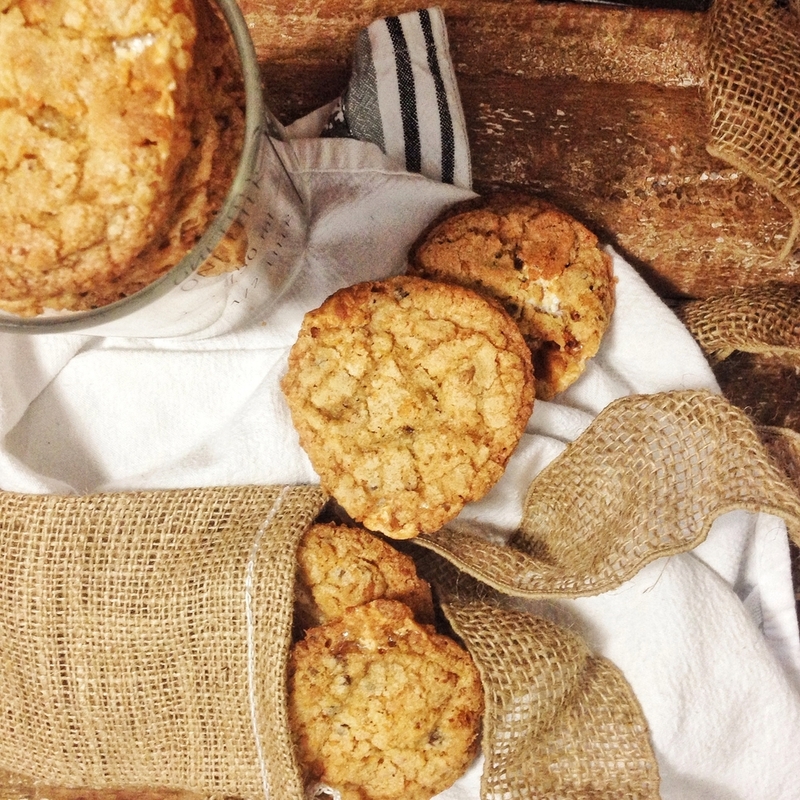 Cool cookies completely on pan before moving them to a plate or an airtight container. 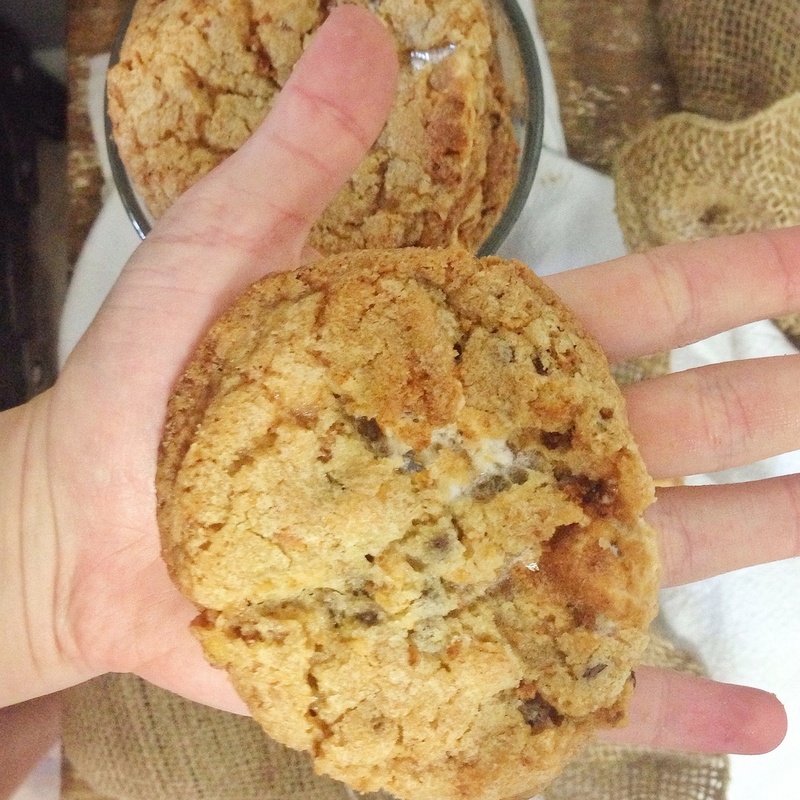 At room temperature, cookies will keep fresh for 5 days-in the freezer, they will keep for 1 month.